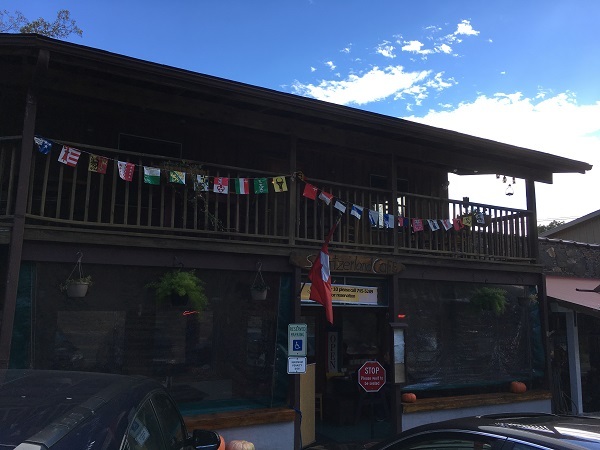 Switzerland Cafe, Little Switzerland NC – Marie, Let's Eat! 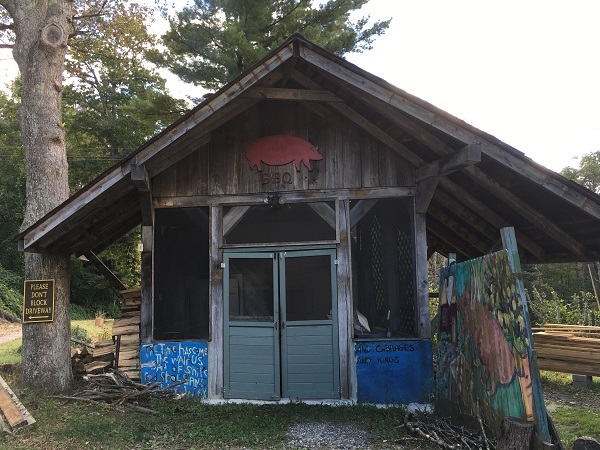 Anybody planning to visit all of the restaurants on the North Carolina Barbecue Society’s Historic Trail will learn that a couple of them require a little work. This one, for example, is at the top of a mountain. I really did have to giggle as I finally realized what it was about the Society’s trail map had been tickling me so much. See, 21 of the 23 on it are pretty easily accessible. There are a pile in the Piedmont Triad, and several in the eastern part of the state. I mean, if you live in North Carolina, they’re all somewhere close by, either to each other or a major population center. Then somebody probably piped up and noted that western North Carolina was not very well represented. And by western, I mean really western, not just “west of I-95” like some wags would have you believe. So whomever makes these decisions grumpily acceded and said that they’d include two restaurants in the west. They picked Herb’s, which is literally the westernmost restaurant in the entire state, with nothing on the other side of it but trees and, eventually, the Tennessee line, and another one that is one heck of a drive. If you feel like visiting the resort community of Little Switzerland, get your car serviced first and make sure they double-check your brakes. It is a long way down. So moving anywhere in the country puts you at geographic disadvantages to other places. In Chattanooga, we’re closer to many places that I want to spend more time than we had been, but we’re further away from the Carolinas. So very early this year, when I was making really good money, I put aside a war chest for a three-day road trip. We’d go when the schools had a fall break and enjoy some of the color, and let Marie have the opportunity to visit two or three of the restaurants that I discovered and loved when I’d gone this direction by myself. We left before dawn one Thursday last month, and Marie drove to Knoxville, where we had breakfast. From there, I took the wheel and enjoyed one of my favorite parts of the country: where I-40 crosses from Tennessee into North Carolina. I love these mountains and tunnels. We stopped in Asheville for just a few moments, so Marie could run into The Chocolate Fetish for a couple of boxes of treats. It took about another hour to make it to Switzerland Cafe from there. We arrived about 12.30 and the place was very busy. It turns out that the small town is quite well known for travelers on the Blue Ridge Parkway to make a stop. I got the impression that was the way that almost everybody who was dining there came, because we saw virtually nobody on either bend of NC-226, which is the way you would come from the interstate. We had about a twenty minute wait for a table, which gave our son enough time to run around. Marie and I each had the same thing, a pork platter with beans and slaw. They do offer smoked trout and salmon as well, which in retrospect I think that I would have liked to have tried, but we were not being very sensible. As I’m typing this, I’m wondering about the smoked trout BLT that a fellow sitting next to us ordered. 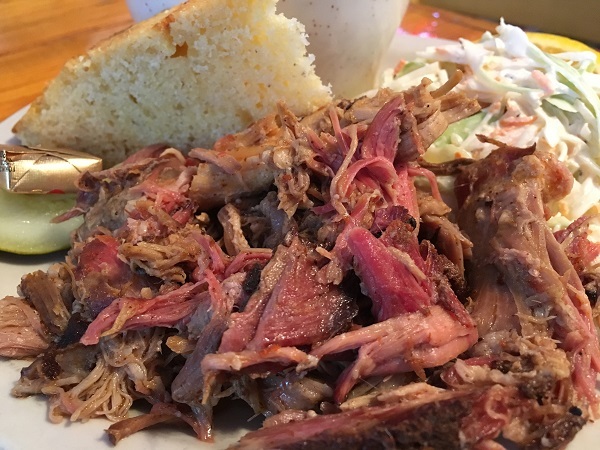 The pork is very good, and proved to be among Marie’s favorites of the ten barbecue places we visited on this trip. If you choose to come this way other than via the Blue Ridge Parkway, there are two roads up the mountain. We went up NC-226, which is the more direct of the two, and were really impressed by the beauty and the view. We went down NC-226A, which is one of the greatest roads in the universe. The slight disappointment came at the bottom; once you reach the base of the mountain, it’s almost another ten minutes before you rejoin the main highway, and we were ready to get a move on. But getting there! I absolutely loved driving down this mountain. It is life-affirming, twisty, steep, curving, and completely wonderful in every way. If you enjoy driving, I cannot recommend this highly enough. That there’s a pretty good restaurant atop the mountain is almost beside the point. This detour off I-40 was worth it just for the experience and the thrill. Are you planning a barbecue road trip? You can see all the barbecue restaurants that we have visited for our blog (more than 400 !) on this map, with links back to the original blog posts! 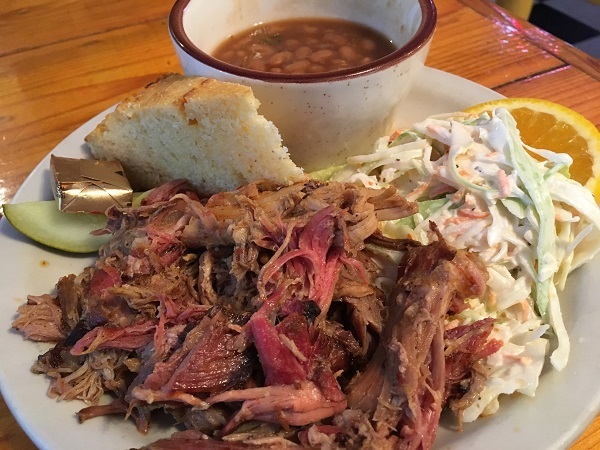 Posted on November 16, 2016 by Grant G.Posted in barbecue, north carolinaTagged barbecue, blue ridge parkway, little switzerland, ncbs historic barbecue trail, north carolina.